Whispers in the Loggia: "Be Pastors, Not 'Pilots'" – For the Bishops, The Pope's "Global Vision"
"Be Pastors, Not 'Pilots'" – For the Bishops, The Pope's "Global Vision"
Once upon a time – indeed, not all that long ago – the most crucial and in-depth speechifying a Pope would routinely offer was the ad limina addresses to the endless groups of bishops making their five-yearly visits to the Home Office, each talk meticulously crafted with an eye to the state of the church on their own turf. Now, of course, the scene has been upended, and the daily flood of homilies, messages, spontaneous gestures and off-the-cuff Francisims has scattered the focus of papal communication far from their traditional programmatic core. 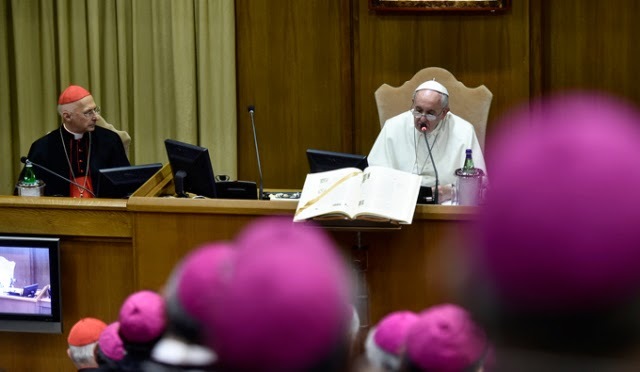 Even so, when the Bishop of Rome has some words for the bench he gets to watch up close – the Italians whose primate he is – attention must be paid. Accordingly, at the start of the CEI's annual spring plenary last night in the Synod Hall, Francis' brief remarks gave a further glimpse of the standard he seeks in the 5,000-odd shepherds of the local churches and, needless to say, the successors he names in their stead. In the Italian context, the headline of the talk was yet another papal push for the prelates to be neither "afraid nor useless in [working to] denounce and defeat a widespread mentality of public and private corruption, which without any shame manages to impoverish families, retirees, honest workers, Christian communities, and throws away the young." "In fact, to us comes being asked to comfort, to help, to encourage, without any distinction, all our brothers and sisters oppressed by the weight of their crosses, to accompany them, without ever tiring of working to lift them up anew with the strength that comes only from God." On the second facet of the attribute, Francis said a "concrete" ecclesiology is found in "reinforcing the indispensable role of laity prepared to take on the responsibilities within their competence. "In reality," he said, "the laity who have an authentic Christian formation shouldn't need a pilot-bishop, nor a monsignor-pilot, nor clerical input to assume their own tasks at every level, from the political and social spheres to the economy and the legislature! Instead, they need a Pastor-Bishop!" The other key quality laid out was "collegiality," something the Pope said was in a state of "widespread weakness" in "some parts" of the global church. Among other examples, Francis cited the habit of arranging "a conference or event that, giving the floor to the same old voices, drugs [orig. : "narcotizza"] the community [into] approving the same choices, opinions and people. "Instead," he added, "let us be transported toward those places where the Holy Spirit is asking us to go." Closing the talk, Francis voiced his hope that the upcoming Jubilee of Mercy would "grant us the grace to rediscover and make fruitful the mercy of God, with which we're all called to give consolation to each and every man and woman of our time." While Papa Bergoglio hasn't yet had a shot at naming a new head to any of Italy's major dioceses, Francis has still upended the native bench with his unprecedented delivery of three voting red hats to the "peripheries" of the Bel Paese, including now-Cardinal Francesco Montenegro of Agrigento, whose "last in line" Sicilian archdiocese includes Lampedusa – the land's end destination for African migrants seeking entry into Europe, tens of thousands of whom have died making the journey, where Francis chose to make an emotional first trip outside Rome following his election. In the process, the Pope has bypassed the traditional "cardinalatial sees" of Turin, and above all Venice, whose patriarch's chair served as the springboard of no less than three 20th century pontiffs (Saints Pius X and John XXIII, and John Paul I). In addition, given the uniquely Italian custom of the conference's president serving not by election, but papal appointment, while Cardinal Angelo Bagnasco of Genoa formally remains at the CEI's helm, the B16 pick is widely thought to have been eclipsed as the body's premier figure by its new secretary-general, Bishop Nunzio Galantino, the longtime parish priest who Francis plucked for the post in late 2013 from an obscure diocese in the country's Mafia-racked southern tier. Meanwhile, given a 400-man Stateside bench whose response to this pontificate ranges from exuberance to exasperation and everything in between, last night's remarks just help set the stage for what could well be considered the most significant ad intra moment of the coming American PopeTrip: Francis meeting with – and, yes, speech to – the US bishops, which is currently set to take place on the visit's first full day, 23 September, in Washington's St Matthew's Cathedral. Even if much of the six-day itinerary has gradually emerged over recent months – topped by the announcement of a first-ever papal address to a joint meeting of Congress – after two separate tours of proposed DC, New York and Philadelphia stops by Vatican advance teams in late February and March, the trip's full schedule is expected to roll out sometime in June.